The chirping of sparrows in the morning is always pleasant to hear, and I’m sure you will agree that to see them feed on the grains spread into the verandah is a favourite activity for many of us. Their very presence around our homes fills us with joy and happiness. The bird we so lovingly refer to as gauriya in Hindi, chiu-tai in Marathi, and House Sparrow in English, has been with mankind for a long, long time – some have estimated at least 10,000 years! This long relationship with mankind, which scientists call “synanthrope” (syn = together with + anthro = man), is reflected in many cultures across the world. The portrayal of the sparrow as a responsible mother, a clever planner, and a faithful friend, is all but a reflection of its docile, harmless, and helpful nature. On the occasion of World Sparrow Day celebrated on March 20, 2014, we are going to look at how important sparrows are for us humans, what are the threats posing these feathered-friends of ours, and what can we do to maintain our age-old friendship with them. World Sparrow Day began quite recently in 2010, after concerned citizens and scientists realized that the cheerful chirp of the sparrows has been vanishing from our backyards. 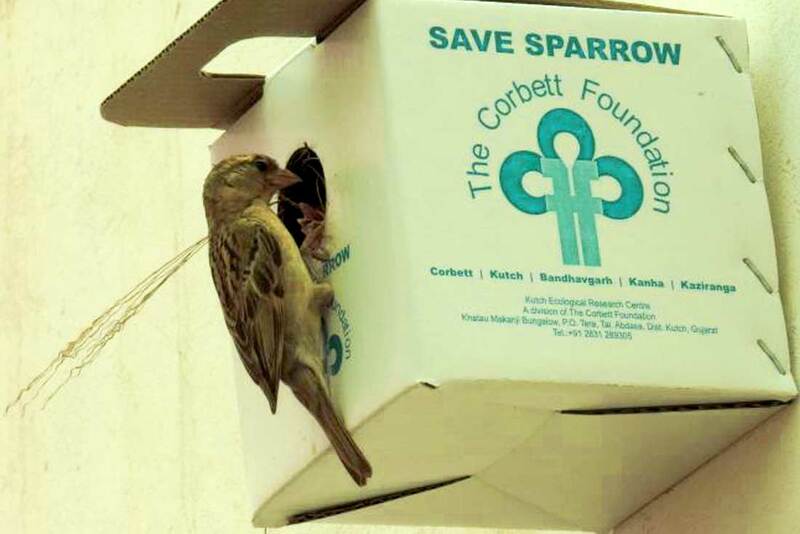 Started first by Mr. Mohammed Dilawar, an Indian conservationist, through The Nature Forever Society, this day aims to create awareness about sparrows as well as other birds with whom we share our cities with. Today, this day is celebrated worldwide to create awareness, but more importantly to involve the citizens of our planet in celebration of the urban biodiversity. Now, if someone asks you why sparrows are important for mankind – we don’t really have a concrete answer. In reality, almost all the wonders of nature are vital for us to survive, but we rarely ever appreciate them. In case of sparrows, they are one of the most efficient dispersers of seeds in agricultural fields, and they feed on insects, lots of insects, which can damage our crops. Let us look at a true story which transformed the view of sparrows and brought them in the forefront of their valuable services to mankind. In 1950s when China was rapidly transforming from an agrarian country to an industrial nation, China ordered the extermination of certain animals, such as rats, flies, mosquitoes, and sparrows, under the title of “Four Pests Campaign”, in 1958. The citizens were encouraged to wage war against these four pests. Given that sparrows feed on grains in agricultural fields, the sparrows were eradicated by forcing them to fly until they fell from exhaustion – nests were destroyed, eggs broken, and sparrows were shot down from the sky. The sparrows of China were nearly extinct – and that’s where problems started. According to an article published online by IO9.com, China was hit by a severe famine between 1958 and 1961, in which an estimated 30 million people died of starvation. With no sparrows left to eat the crop-damaging insects, agricultural yield became negligible. Locust populations swarmed in agricultural fields, and they had to import sparrows from Russia (then Soviet Union) to control insect populations! The extermination of sparrows, in addition to widespread deforestation and misuse of poisons and pesticides was said to contribute to the Great Chinese Famine. There is no doubt now that sparrows are vital for us humans in keeping us well-fed and healthy. 1. Loss of nesting sites since today’s modern houses and apartment buildings lack the nooks and crevices where sparrows could once nest. 2. Loss of food sources, especially that of insects which sparrows feed to their young. 3. Loss of “green spaces” such as gardens and tree-cover in cities. 4. Increase in electromagnetic radiation such as that from mobile towers, impacting the fertilization and hatching of sparrow’s eggs. 5. Increase in populations of other highly competitive urban birds such as crows, pigeons, and mynas. These birds compete not only for food but also nesting spaces. 6. Increase in rat populations which prey on eggs and hatchlings of sparrows. 1. Let there be plants – especially dense thickets and grasses which the sparrows can use as a hide or nesting material. Lemon grass, ferns, and other plants which can grow in pots are excellent for sparrows. 2. If you own a garden, let a part of it grow absolutely wild to encourage growth of insects. 3. Provide birds with grains such as maize and rice, and water. Make sure pigeons and mynas don’t out-compete sparrows at feeding sites. 4. Be aware of any radiation from mobile towers in your vicinity since it is not only sparrows but they are also researched for their impact on human health. To build your own nest-box, you will need a shoe-box with its lid, tape, rope, and some hay. 1. Make sure the shoebox has a lid! It is important that the nest-box is covered from all sides. 2. On the breadth-side of the box (the narrow portion of the rectangle), make a round hole in its centre. If you want the nest specifically for sparrows or other small species of birds, it is important to make the hole of the right size to discourage other birds such as pigeons and mynas to nest in. Ideally, a circle with 3 to 4 cm radius will work for sparrows. 3. Make some small 1 cm holes along the length of the box for better ventilation. 4. Use tape to seal the lid of the box. If you want to make it weather-proof, use the tape to cover the entire nest-box, but make sure to leave the ventilation holes free. 5. Tie the nest-box in the corner of your roof or grill in your balcony where rats cannot reach. Ideally it should be in a corner of the house with least human disturbance. 6. If you can manage to find some hay, sprinkle it down near the nest, along with some grains. Sometimes it takes only a few days or even hours for a prospective pair of birds to find a tempting nest, but it also takes years for the birds to find it and get used to it. Let the nest remain there without disturbing it and you will soon have new neighbours living with you! The idea behind celebrating World Sparrow Day is to protect sparrows, our closest feathered-friends, but also to appreciate the urban biodiversity around us. The importance of all the species living on our planet may not be known to us, but they are important for the functioning of our planet’s ecosystems which we are a part of. We wish you all a very happy World Sparrow Day! Do share your experiences and stories of sparrows and other urban biodiversity with us!